Entropy in social systems appears – manifests itself – as tensions. Manifestations of entropy in social systems. Entropy in social systems appears – manifests itself – as tensions. Tensions – ‘social entropy’ – are generated by interactions – irreversible processes – between humans, between humans and communities, between communities, and between societies and states in the (State-)System, etc. Tensions can be compared with the heat produced by friction, e.g. in engines. Tensions can be considered social entropy. A closer look reveals that tensions have the same qualities and properties as entropy; we never recognized tensions as a form of entropy. Tensions can be considered degraded energy, an unavoidable byproduct of (human/social) interactions. Tensions are also equivalent with (new) possibilities and (thus) uncertainty; tensions allow for – are the source of – new arrangements (microstates) in social systems. 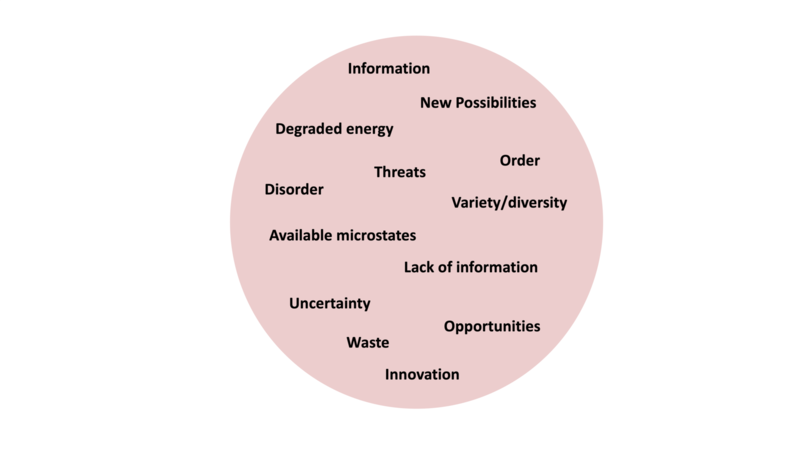 Tensions – new possibilities – can be considered threats or opportunities, depending on how these tensions are qualified in a social/human context. In fact, also threats constitute also opportunities; possibilities to adopt new – more favorable – arrangements. A living system – be it an individual human, community or society – must (one way or the other) regulate its energy in- and output, but also the entropy – tensions – it produces. Living systems have various mechanisms to regulate energy and entropy, to maintain a certain balance (homeostasis). As I discuss later, a relationship exists between the ability of living systems to explore and exploit entropy – new possibilities and opportunities – and their well-being and survival chances. The survival changes of societies (humanity) are (also) contained in their ability to generate, explore and exploit new possibilities (diversity). For living systems – including humans, societies and the (State-)System – a certain entropy balance – an intermediate level/amount of entropy – must be maintained (besides the availability of a certain level of energy): Not too much entropy – resulting in too much disorder, and a lack of structure – but also not too little entropy, resulting in ossification; a lack of opportunities and adaptability.